The update could be transformational for everyday iPhone owners. Apple showed off many new features of the new iPhone during its “Gather round” event earlier this month, but there’s one major update that didn’t make it to the main stage. It was an update to the iPhone’s NFC (near field communication) support, the tech that lets you scan your iPhone to checkout through Apple Pay. Before iOS 12, users of NFC-equipped iPhones needed to open an app to access this feature. 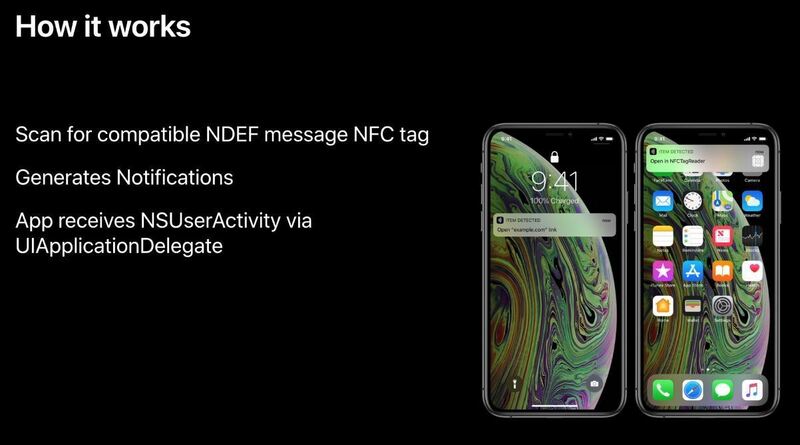 But the day after its event, Apple told developers that iOS 12 would support NFC “background tag reading” on the new iPhones, meaning once these iPhones are unlocked after booting up they constantly scan for NFC tags. With the new NFC implementation, as long as an iPhone XS or XR is within 1.6-inches of an NFC tag, it displays a notification you can tap to open an app or link in Safari. “We are excited to see how this will make the user experience even better and make it easier for apps to handle NFC tags,” said Lawrence Chung, wireless software engineer at Apple, in a Tech Talks video. A screenshot from Apple’s Tech Talks video explaining the new NFC Core update to developers. The update could have a huge impact on everyday iPhone owners and businesses alike. Craig Tadlock, CEO of GoToTags, one of the top sellers of NFC tags and hardware for encoding tags with digital information, said his company already sees an uptick in interest. Tadlock told Macworld that his company has seen ten times the traffic on its website, social media, and email since Apple’s NFC announcement. Connected things are essentially digital experiences found in everyday objects. For example, a tag on a movie poster could open up a trailer when you scan it with your iPhone. Or scanning an action figure would let you see a digital version of the character. (Think: Nintendo Amiibo.) You could scan packaging on furniture or appliances to open step-by-step directions via text or even a video. Tags in grocery stores could also give you dietary information about what’s on the shelves. “Just look around your home and office and start imagining what is the natural digital action for each item if you touched your phone to it,” Tadlock said. According to Tadlock his company had seen steady growth before the NFC update, but potential customers sometimes told him to “let me know when this works on the iPhone.” Now that it does, he expects to see many more products shipping with NFC tags to provide directions, documentation, registration, warranties, and more. “It will be expected and natural for items to be tagged, both consumers and brands want it,” Tadlock said. 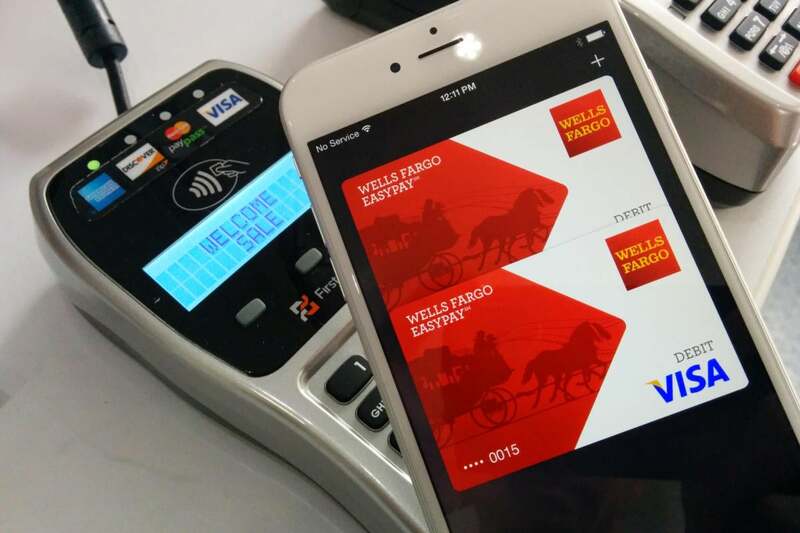 Apple Pay’s NFC feature first appeared in the iPhone 6. 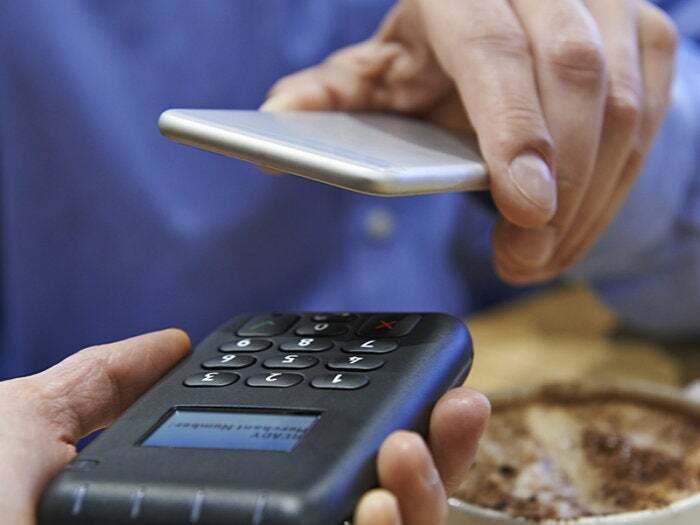 Is Apple just catching up to Android with NFC? Apple first introduced NFC in the iPhone 6 in 2014. But Android has supported NFC for numerous uses since 2010. For example, owners of Android-enabled NFC smartphones have used to NFC to scan a “business card” with a tag to get contact information or scan an area on a map to get directions at a conference. David Shalaby, founder and CEO of TapTrack, told Macworld that Apple’s update has taken a page from Android with its background scanning feature, but has limited the types of data it can handle to URIs and URLs, instead of supporting a larger range of data types, such as text. “In this way, it’s not as flexible as the analogous Android capability but is still very useful since a lot of information can be put into a URI,” he said. Similar to URLs, URIs are another less specific string of characters that bring up data from the internet. “Being able to launch a URL from an NFC tag on an iPhone without an app truly is a day of reckoning for all of us,” he said. Are there new security risks? One question that arises from Apple’s NFC update is the possibility of new security risks. In 2012 and 2014, cybersecurity developers at a conference used previously unknown flaws to hack NFC-enabled smartphones. He said his organization hasn’t yet evaluated Apple’s new NFC feature for security, but at the upcoming Pwn2Own Tokyo conference attendees can use NFC to win $60,000 if they successfully hack an iPhone. But Shalaby of TapTrack said he doesn’t think Apple’s new NFC feature presents any new security flaw.